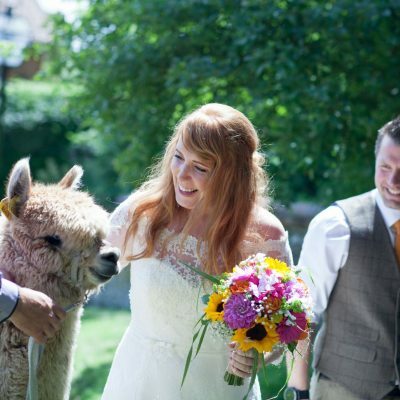 The team at Alpaca Evolution have always been delighted to attend weddings and events. 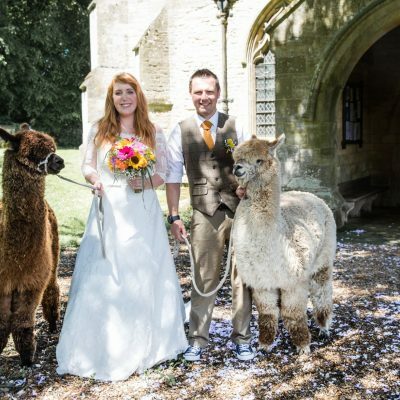 The Alpacas bring that special extra to a couples big day or a family party. We offer a selection of packages to suit any budget as well as offering you the opportunity to customise a bespoke experience best suited to your vision. We also offer a selection of additional items to add that finishing touch to your event. The silver package is our most affordable option and includes two Alpacas and their handler to attend your wedding for 90 minutes. The Alpacas will come with their own penning and guests can take the opportunity to learn all about these enchanting animals or simply admire their quiet charm. Our trained and experienced handler will walk the alpacas amongst the guests allowing for a truly up close and personal encounter with the alpacas. You and your guests are welcome to photograph the alpacas during this time. The Diamond package will include 4 alpacas and two handlers. This package offers all that the Silver Package provides, but in addition to this the time slot is for 2 hours. 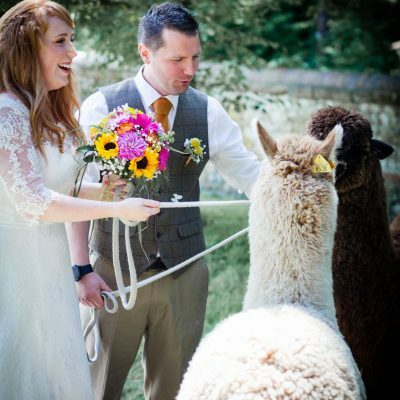 This allows for the newly weds to handle the alpacas on a “walk about” and, if they wish, capture some very special official photos with their photographer. We will also provide feed for hand feeding to the Alpacas (no guarantees they will always cooperate!). The Diamond package includes 50 charming wooden Alpaca Wedding favours. Personalisation can be added at an additional cost. The diamond package includes a 20% discount on our shawls. If you can’t find quite what you are looking for, or you have a different event in mind. Contact us and we will tailor the package to suit your requirements and budget. A beautiful hanging wooden Alpaca ornament as a memento of your special day for your guests. We can customise ribbon colour to suit. 1 to 50 for £2.50 each. More than 50 for £2 each. When booking one of our packages why not consider stunning your guests with a special surprise! 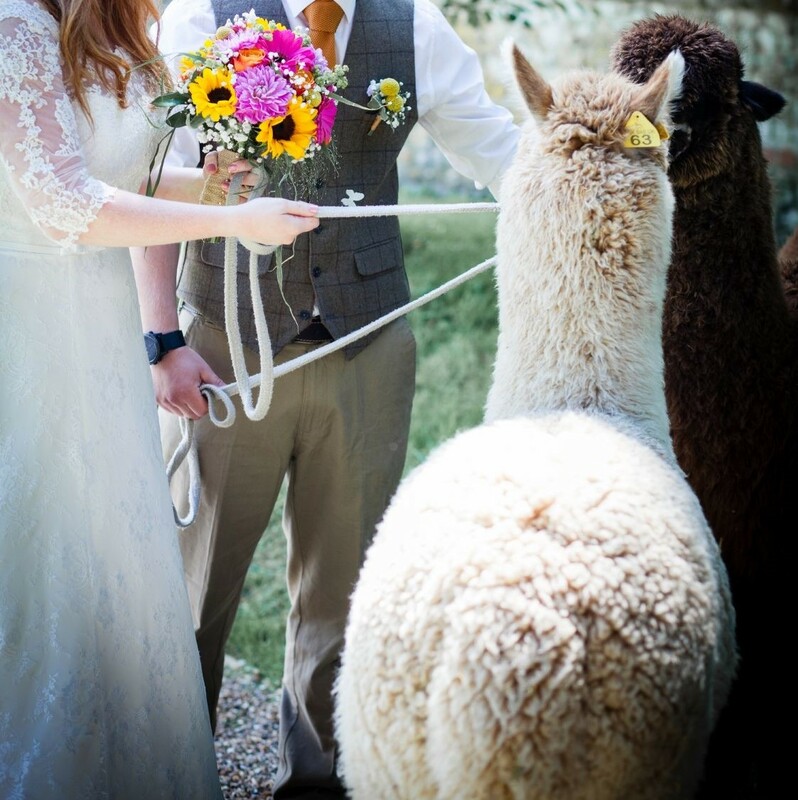 Let them watch in awe as our Alpacas accompany your rings down the aisle. This option will require a groomsman to handle the alpaca or one of our own handlers to be in attendance. Beautiful lightweight luxury shawls woven from pure baby Alpaca yarn or blended with silk. A magical addition to keep the bridal party warm for cooler summer evenings or as a warming addition to the winter wedding. Ideal for the brides, bridesmaids and guests alike.